Tonya Rapley is a the millennial money expert and creator of the award winning site, My Fab Finance. In 2014 she was deemed the “New Face of Wealth Building” by Black Enterprise Magazine and featured as their cover subject. A millennial herself, Tonya’s mission is to help millennials break the cycle of living paycheck to paycheck so that they can become financially free and do more of what they love. Tonya is a full-time entrepreneur and tours the country providing workshops for private and nonprofit clients. Her client list includes Fidelity Investments, Prudential, the National Endowment for Financial Education and FinCon ( the financial bloggers conference). 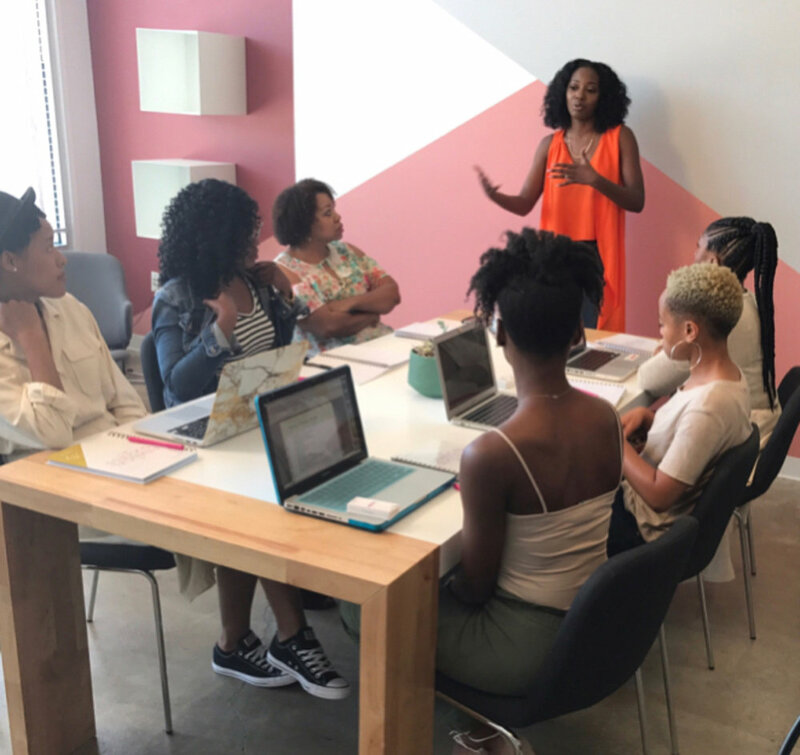 Tonya has spoken at Bloomberg, Essence Fest, Millennial Week, PepsiCo, the Blogging While Brown Conference, BlogHer, Circle of Sisters and a host of colleges and universities. Tonya: I can say I had a pretty good childhood. Both of my parents were in the military. They were career military. There was a lot of stability for my younger sister and I but there was also a lot of expectations imposed. My parents were those parents where I’d be like “But Dad, I have a job, I’m on the Dean’s List, I’m taking AP classes... ” and my Dad was like, “That’s what you’re supposed to do.” My parents always had high expectations for my sister and I but they also taught us hard work and integrity early on. Combine that with my military upbringing and living in different places, it wasn’t unusual for us to move every three to five years, I was consistently having to make new friends and consistently having to reinvent myself. Now as an adult, I understand how that has served me and it has fed my curious spirit. People ask me what I wanted to be when I grew up and I just wanted to be able to explore my curious nature and the things I enjoyed doing. I never wanted to be locked into one job or one place the way I saw my parents locked into their military commitment. What was your favorite place when you were traveling around as a kid? Tonya: Germany was amazing even though I have not been back as an adult. I want to try not to romanticize it, but I remember it being so green. Going to school there was amazing. We went on field trips every month. When we got back to the States, we moved to Oklahoma. It was the complete opposite-a dust bowl and red clay dirt. We didn’t go on field trips. When I was a kid, we went to the Brothers Grimm’s house, castles, and caves. I just remember Germany as being really clean and the people were really kind. We lived in a village right outside of Frankfurt called Zepplenheim. I’m a total dweeb so sometimes I would go on Google Earth and be like “Dad, what was the address?” and go and look at our old neighborhood. I would say Germany was my favorite place and I’m looking forward to getting back there. Where were you working before you started My Fab Finance? Tonya: I was working at the YWCA in Brooklyn and I ended up leaving there. Here’s the thing about the transition: It was a non-profit job and I had a lot of responsibilities and it wasn’t a place that would foster the creation of my business. I ended up looking for other employment opportunities to go to a place that understood and respected that I was trying to grow a business. I ended up leaving YWCA and going to the Center for New York City Neighborhoods where I did foreclosure prevention and education throughout the entire city of New York. I honed my skills as a community organizer. I was working with elected officials, the state attorney, and the state attorney’s office on foreclosure education and outreach events. I’m trucking to Staten Island and the end of Brooklyn to do these events. It was in alignment with my passion but it was also that they understood. Some workplaces won’t be supportive of your external endeavors. During the interview, I was like “This is my blog and I blog about finance.” They saw that as an asset. My Executive Director was like, “What classes can you take?” I was taking business writing classes, event planning classes that they were paying for but they also saw it as a benefit for them and it was a benefit for My Fab Finance. I worked there until I resigned and it was challenging to resign because it was a great job. It was a different kind of non-profit and my office overlooked the statue of Liberty. They paid 100% of my healthcare benefits and my husband’s benefits and before I left they had given me a $15,000 raise. I walked away from all of that because I was like, “This is cool but this isn’t what I’m supposed to be doing.” My Fab Finance is what I’m supposed to be doing at least at this time of my life. how did you find courage to leave a good job for My Fab Finance? Tonya: They say nothing is an accident but I did kind of fall into finance. I have a Bachelor’s degree in Public Administration and I have a Master’s degree in Urban Policy. I was doing community work in Brooklyn at the YWCA of Brooklyn and I was creating social justice events for the greater Brooklyn community. I brought in a financial education event. I’m sitting in the back of the event like, “Tonya, you don’t have your life together.” That’s when I talked to my sister and said, “You know what? I’m going to get my money right. It’s that time. Being broke isn’t cute and you are too old for this.” I was 27 when I had the revelation. We all have those moments where we’re like, “This is not right.” It was to the point where it was “Okay Tonya, you actually have to do something about this.” I created my site with the hopes of getting free clothes. I’m very transparent about that. Then I started sharing the resources that I was finding and realized that financial education wasn’t as hard as I thought it would be. Growing up I really struggled with math and I used that as an excuse not to be good with money.I started sharing what I learned and other people started to share the content like “Oh thanks, can you talk about this?” and I said, “I don’t do this but I can talk about it.” I started sharing it and this wasn’t my first time starting a blog. How did you turn a blog hustle into your full time career? I put in the work and resigned from my job in September 2015 to do My Fab Finance full-time and I’ve been doing it full time ever since. Now it includes classes, public speaking with college students or millennial women about financial freedom, partnering with brands that I believe in and helping them create finance based content for millennials. I’ve done quite a few events with Fidelty which has a Women’s and Young Investors program so I’ll create influencer programming for them to work with influencers. After the recession of 2008, there was a lot of mistrust of the banking system and institutions. How do you regain the trust of the millenials and how do you earn the trust and create products that serve our needs? I’m consulting with brands on how to effectively do that. What are the major issues you see in millennials when it comes to managing money? Tonya: There’s what we need to know and the issues we have. Issues of course are student loan debt. Most millennials have student loan debt. I can’t walk into a room and not talk about that. There’s understanding how credit works. Even though all of us have a credit score, a lot of people don’t understand how credit works and how to improve their credit without having to pay others. With Instagram and social media, we are privy to the success of others and it leaves us feeling like we’re behind. We feel like we have to play catch up and do everything all at once. Helping people understand “No, you don’t have to do everything all at once.” Based on your financial goal, this where you need to start. One of the biggest issues for millennials is understanding what your goals are. Your goal might not be the goal of someone you went to high school with who now lives in Tallahassee, Florida and you live in New York. You have two very different economies that you are a part of. How do we create goals that fit your situation, your dreams, and your local economy as well as the global economy? I think it’s understanding that you don’t have to play catch up and do everything at once, pulling it back and setting goals so that you are knocking them down one by one instead of getting paralyzed or overwhelmed by the amount of work you feel you have to do. What’s the best thing about being an entrepreneur right now? Tonya: Two things: You have the control over the money that you make. You have the ability to assert what you’re worth and work on things that you care about, especially the type of entrepreneur I am because my projects are changing. There could be moments where I’m like “I’m not interested in that. If you want me to do that, you’re going to have to pay me the most.” There are also times where I really will love a project and I’ll get on board with it. The freedom of flexibility is great too. I’ve been in New York this entire week working. I’ll go back to L.A. and still be able to work. Me and my husband went on our honeymoon to Bali and Thailand and against his preference, I was still working when I was in Bali. I knew I wanted to work internationally and it was kind of challenging. Being able to take my work internationally and not have to get approval from anybody...that’s one of the best things about being an entrepreneur. How are you able to get partnerships and speaking opportunities internationally? Tonya: It’s not what you know, it’s not who you know, it’s who knows you and making sure I consistently show up for My Fab Finance and Tonya Rapley. My SEO is on lock. When you look for “millennial finance expert” most likely I’m coming up in a couple results. If they’re looking for a Black millennial financial educator and expert, I’m definitely in those first three responses. Being very intentional with SEO and coding of my site, and being very intentional about my branding. I’m a millennial finance expert and if you look on Instagram, Twitter, and Facebook and search any of those terms, you’re going to find me. For public speaking, I hired a speaking coach who I’ve been working with throughout the year and that helped grow my speaking business exponentially. Not just in how to find new clients, which was essentially putting myself in the room with people who booked speakers, but also refining my message and speeches and helping me feel more confident as a public speaker. When you feel confident, you go out and kill it. The best way to advertise yourself is for someone to see you doing it and killing it. I have two managers right now. One manages my spokesperson work and one manages my media related stuff for partnerships but I’m not above doing the work myself. I’m still responding to emails and I think a lot of people get to the point where they’re like, “Girl, you have an assistant. Why are you responding to these emails?” That’s one of the things my parents ingrained in me as a child: “Yes, you’re cute and smart but you still need to do the work.” You can’t expect anything to be given to you. Who you choose to be on your Mt. Rushmore of Inspiration? Tonya: One of my good friends Marsha of the Finance Bar and a fellow financial expert. I call her my godmother. Marsha inspires me because of her interpersonal communication. Marsha cheers her people relentlessly and she’s not threatened by individuals. She has inspired me to be a better woman, and a better supporter of fellow women entrepreneurs. Relationships matter. She’s taught me how to treat relationships better, especially those that matter to me. Another woman that inspires me is Lisa Nicole Bell of the “Behind the Brilliance” podcast. We recently had the opportunity to become friends. Her podcast is actually the first podcast I ever listened to and I was on her podcast recently. Lisa is just killing it. Totally humble, from Alabama and living in L.A. She’s just one of these friends that I have that are doing it well. It’s important to have those friends that you can talk about your successes with. One thing I have learned in this journey is that I don’t put celebrities and influencers on pedestals because they’re people just like me. I really aspire to be like people that I know that are doing the work. There’s also Julian Gordon. Julian Gordon is creating this mastermind movement and is teaching people how to create successful masterminds but he is my business coach. Julian is the person that will not allow you to play mediocre. You go to him with your plan and he’ll rip it up and everything. You might be crying but at the end of the plan, you’re like “I get it. You had to break me all the way down.” He’s one of the smartest people I know. As far as strategy, he listens well and he holds space well, and I aspire to be more like Julian. He’s very vulnerable and transparent with what he has going on in his life but he’s also very successful. He’s not big on social media but he is six figures and killing it. Tonya: I would say creating change in underprivileged communities, exploring what privilege means, and exploring how I can create change. Also music. I moved to New York City with a music blog. My father was a Air Force DJ. He did all the parties on base. When I moved to New York, I wanted to be a music supervisor. Music is my first love and creating change is my second love. I’m currently working and living in my second passion. I’m working on a project in the cannabis industry that allows me to infuse my love of music. That’s the next part of my journey. I partnered with two women to create something called Cannaclusive which is driving diversity and inclusion in the cannabis space. 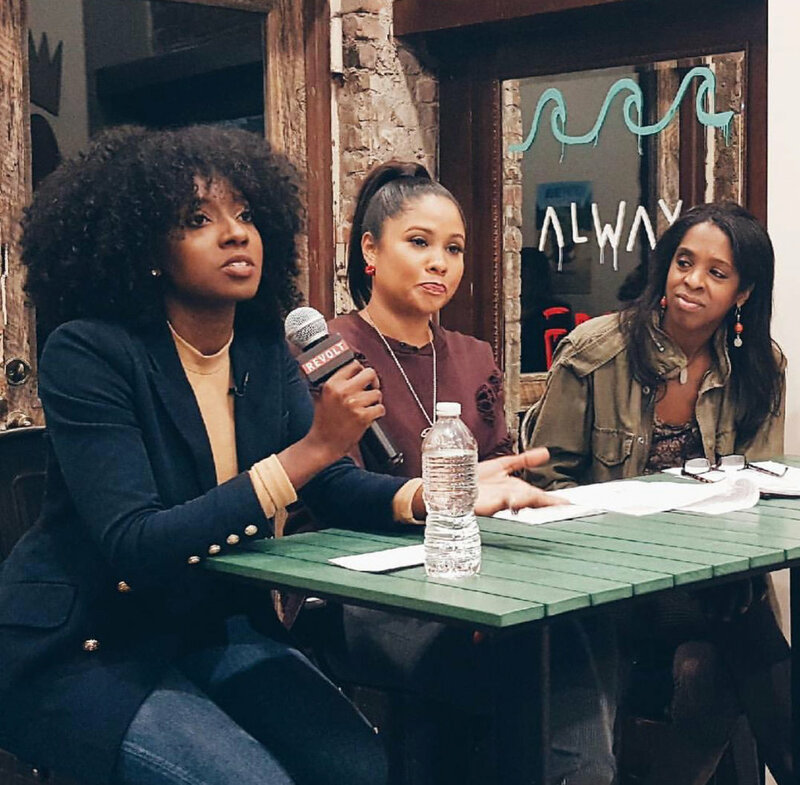 We had our first sold-out event in L.A. this past Fall and we’re looking to grow. We have diverse stock photo imagery because we realize there is a stigma associated with smoking and that you can’t be a successful smoker. There’s also a stigma within the industry that a person of color that smokes is a rapper like Wiz Khalifa or Snoop. We just want to make sure that we are fairly represented and that people of color don’t get left behind in the legalization wave. The only disadvantage I’ve seen is when brands would say ‘Oh, we have a Black millennial influencer already.” You all have six other White women, why do you only need one Black woman. Dealing with that and feeling like one perspective is enough and represents the entire experience. That’s been a challenge, especially working with brands as an influencer. It also has served me well. I have an Afro and I walk into the room and who’s not going to remember the Black woman with a big Afro? It definitely has served to my advantage, figuring out how to turn something that could be seen as a disadvantage and turning it into an advantage. What's your driving factor to succeed? Tonya: I would say never having to work for anybody again. Ensuring I can be a present parent. Growing up with two military parents that were often told where they had to be, what they had to do, and how they had to do it...I want to be free to parent my children and be involved in my children’s lives and those who I love as much as possible. Success for me looks like financially being able to support myself while I am available to the people that I love the most and creating my own life. Once you get a taste of freedom, you don’t want to go back. That’s the driving factor. I don’t want to go back. What SEPARATES people that take that leap and make it work and the people who don’t? Tonya: The people who make it work, do the work. I would say that. As an entrepreneur, your days can start in the morning pumped but you get an email and the deal doesn’t go through... There’s still more work to be done. Consistently putting in the work and showing up. Action. There’s a difference between saying what you want to do and doing what you said you want to do, and executing with a strategy that serves your long term goal. I feel like a lot of people who struggle as an entrepreneur have a hard time with execution as well as managing personal relationships. When you’re a business owner and entrepreneur, personal relationships matter. People talk. Every opportunity can be magnified five times when someone talks about the opportunity and how you were partnering on that opportunity. There was a Ma$e interview recently and he said, “Never forget who turned on the lights for you.” Everybody needs someone to turn the lights on for them. You never know who’s going to turn the lights on for you. You don’t know who has that power. You don’t know who’s standing next to the switch. What’s one book you’ve read that has changed your life? Tonya: I read the The Magic of Thinking Big right around the time I started My Fab Finance. That book was really powerful. I’m really big on spirituality and I think Feel It Real is by Denise Coates. I read that when I first resigned from my job because it’s all about putting yourself in the vibration and the feeling that you want to experience. It’s all about being in that vibration of success and being mindful of that. Right now, I’m reading Where We Stand by bell hooks. Very reflective. I address my own privilege as a Black woman who was raised by two military parents and understanding that stability was a part of my foundation. That’s a privilege in itself. Privilege and access to education and opportunity and good school systems and so forth. That’s the privilege that I have and not taking that for granted but also making sure I’m empowering other communities of that place and privilege. What are the keys to becoming a successful entrepreneur or millennial finance coach? Tonya: I would say understanding every experience in your life is part of your toolbox. You might not use it all at the same time but understand how to use those experiences to your advantage. Understand that sometimes, your pain and being truthful about your pain can be an asset for your business. I’m a survivor of financial abuse and domestic violence. For My Fab Finance, that has served me because for one, I don’t feel that my finances would have been as compromised as they were at the beginning of my journey had I not been in that relationship. It allows me to approach my work from a passionate perspective because I spoke about privilege it’s that “pull yourself up by your bootstrap” but not understanding that things happen and being compassionate about serving in that manner. It’s understanding your experiences are part of your toolbox and you use them at different times. Don't expect people to support you initially. Sometimes people don’t see your vision because your vision isn’t that good. Some people need to see you show and prove, too. I was a serial entrepreneur where I had all these ideas and people were like “When are you going to do something?” I really had to show and prove. Make people believe. Do the work. Become so irresistible that people have to believe going forward. They have to see and get on board and say, “I see you doing your thing.” That’s one of the biggest compliments for me. Interested in learning more or connecting with Tonya?